Dreaming of Footpaths: Week 3, Day 6: Parkrun, Deep Puddles & Importance of Warm Ups! Week 3, Day 6: Parkrun, Deep Puddles & Importance of Warm Ups! Swindon parkrun is a lovely course in Lydiard Park and the route is like a balloon on a string. You start on a nice straight path and do 2 loops of the park at the top of the path and then at the end of the final lap you come back down the ‘string’ and a sharp left to the finish funnel! It’s nice because the paths are all hard surfaced - although you get a bit of cross-country with the puddles - and you can see the runners spread out in front and behind you all the way around. So you have a visual reference as to whether you’re going too fast … or slow! Swindon parkrun always has a nice friendly atmosphere and today was no different. 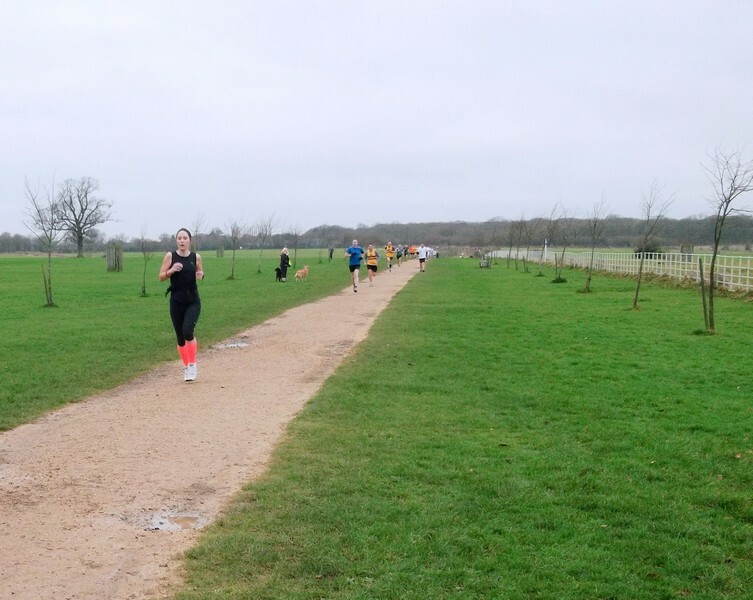 There were a lot of gold and blue shirts as Wootton Bassett Hounds had their first run of the season and the friendly competitiveness set the tone for the parkrun. It was announced before the start that today the route was going to be run in reverse … so instead of a short, sharp uphill and a long lovely slow downhill we had a sharp downhill and a long slog up the hill at the back. As is tradition at Parkruns, everyone – including me - started off too fast. Although when Swindon parkrun does the route in reverse, it’s sensible planning to avoid the bottleneck at the gate at the bottom of the first hill! It felt great though to run with so many other people (337 in total today!) as I do a lot of running on my own. It’s so much more fun with other people although there was a fair amount of dodging around people involved and a dog hurdling incident …! 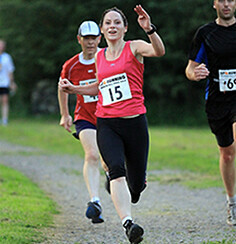 if you were running too close to the runners in front you ended up wearing a fetching pattern of mud splatters. The puddles were quite deep so a fair amount of strategy was involved. Do you run on through hoping that the path you picked was in the shallow end or do you hope from path island to path island? One last straight path and –in theory – a downhill although I couldn’t persuade my legs that. Pushing down the last straight and a sharp left around the corner and the finish funnel in the distance. Grab the token … and finish. Finished the cool down and headed back to the cafe for a coffee and a chat. The café is filled with runners and above the noise of the chat you can hear the discussions of the course, ‘paces’, ‘puddles’ and ‘damp to the knees’. Tested out the coffee … and the ice creams and discussed the best puddle-avoiding strategies. Although apparently this week we had it easy as the last couple of weeks they’ve been ankle deep. Eek! I had to wait until 6pm for the results to be loaded onto the Parkrun website but it was good news … new PB, 2nd woman and 1st in age category. Course PB by 45 secs and 5k PB by 25 secs. Great post again Sarah and a fab new PB!!!! Thank you!! :) Can't believe I'm so close to the '20s' !! Eeek!! Tomorrow ... The World!! !